Our Batch Digester solution monitors black liquor composition which enables advanced control schemes in the batch pulping process. The DURALYZER-NIR analyzer is used to capture the information from the black liquor composition in the spectral signature of the black liquor sample. The black liquor composition contains a wealth of information relating to various pulp properties. The residual effective alkali (EA) profile is an indicator of exiting kappa number while the residual active alkali (AA) profile, lignin profile and total Dissolved solids (TDS) profiles are indicators of exiting pulp yield. These time varying profiles can be correlated to the average kappa and yield of the exiting pulp. Another option is to use the mass balance model to directly calculate kappa and yield during the course of the cooking process. Monitoring of the EA profile during temperature ramp-up allows the alkali to wood ratio to be trimmed prior to sealing the digester. This results in a more consistent charge of cooking chemicals for each cook. Lastly, a variety of pulp properties (e.g. kappa number, relative yield and viscosity) can also be directly correlated to the liquor spectral signature. The DURALYZER-NIR analyzer solution easily provides accurate measurements of the batch digester control scheme in a timely and reliable manner. 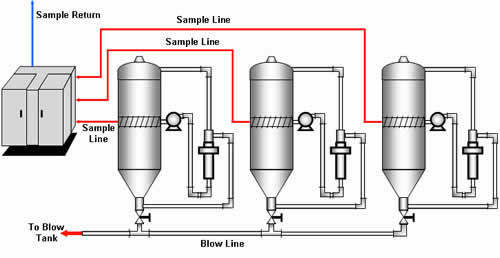 The graphic above shows how the DURALYZER-NIR digester analyzer is implemented on batch digesters running a standard kraft cook. Each digester has a dedicated sample line supplying the analyzer. All samples flow from the process through the analyzer and directly back into the process. One analyzer can support up to eight different digesters. 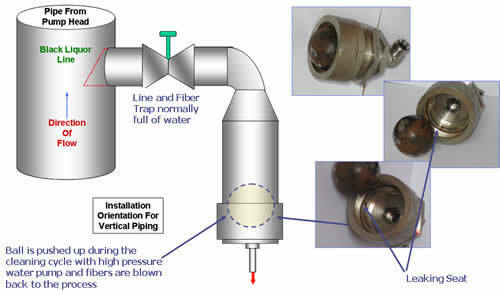 Proprietary filters combined with a high pressure backflush system ensure that line plugging due to chip debris does not interfere with sample collection. And proprietary high-cycle life valves ensure that valve maintenance is not required for two or more years. Normally current sensors for this application are the same as for the continuous digester case and include hybrid systems composed of some arrangement of a refractometer, conductivity meter and UV absorption meter. A major drawback to these hybrid systems is that each meter has to be calibrated for the particular component that it will be measuring. And since this is a collection of single point measurements, it's susceptible to the same drift issues as conductivity meters are for white liquor analysis. Online titraters are another option for this application yet titraters are limited to measuring only residual EA. Also, the application's maintenance requirements for an online titrater are quite high. Because of limited measurements and steep maintenance requirements, it is difficult to justify the capital investment for a titration based solution.